Suspected stolen property seized from the Canberra City home. Photo supplied by ACT Policing. 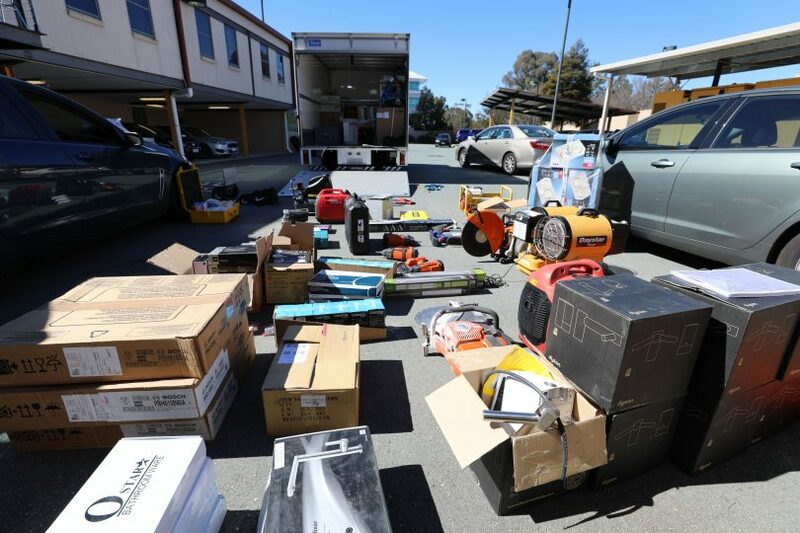 Police seized drugs, ammunition, a sum of cash and a significant amount of suspected stolen property during a search of a Canberra City home yesterday. A 33-year-old man was arrested at the residence and charged with property, firearms and drug offences. He was taken to the ACT Watch House and will face the ACT Magistrates Court at a later date. Members of ACT Policing’s Targeting Team and City Response Teams executed a search warrant at the Canberra City residence yesterday as part of an ongoing investigation. The drugs seized are suspected to be cannabis, cocaine and anabolic steroids. Officer in Charge at Tuggeranong Police Station, Station Sergeant Chris Meagher, said the outcome achieved was the result of police focussing on targeting recidivist offenders. “This is a good result for police, but also serves as a reminder that any information, particularly from the community, is essential to police investigations,” Station Sergeant Chris Meagher said. Police have asked anyone who sees or hears anything they think is suspicious to contact Crime Stoppers on 1800 333 000 or provide the details via www.act.crimestoppers.com.au. Information can be provided anonymously.